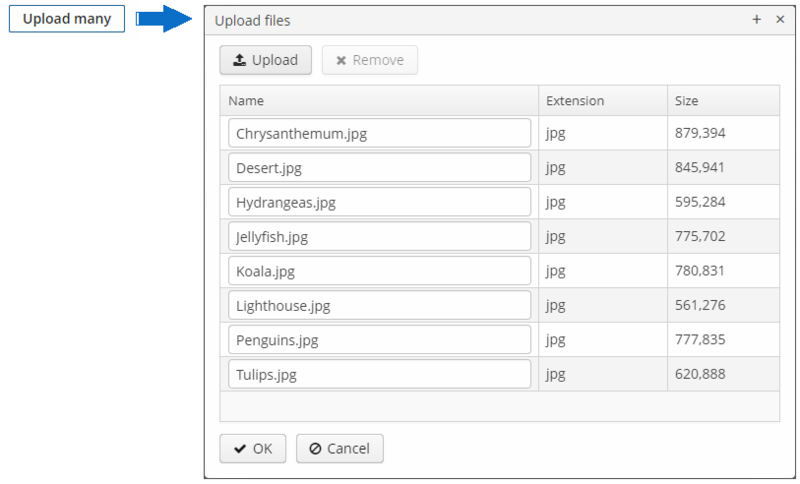 The FileMultiUploadField component allows a user to upload files to the server. The component is a button; when it is clicked, a standard OS file picker window is shown, where the user can select multiple files for upload. XML name of the component: multiUpload. Below is an example of using FileMultiUploadField. In the screen controller, inject the component itself, the FileUploadingAPI and DataManager interfaces. 1 In the onInit() method, add listeners which will react on successful uploads and errors. 2 The component uploads all selected files to the temporary storage of the client tier and invokes the listener added by the addQueueUploadCompleteListener() method. 3 In this listener, the FileMultiUploadField.getUploadsMap() method is invoked to obtain a map of temporary storage file identifiers to file names. 4 Then, corresponding FileDescriptor objects are created by calling FileUploadingAPI.getFileDescriptor() for each map entry. com.haulmont.cuba.core.entity.FileDescriptor (do not confuse with java.io.FileDescriptor) is a persistent entity, which uniquely identifies an uploaded file and then is used to download the file from the system. 5 FileUploadingAPI.putFileIntoStorage() method is used to move the uploaded file from the temporary client storage to FileStorage. Parameters of this method are temporary storage file identifier and the FileDescriptor object. 6 After uploading the file to FileStorage, the FileDescriptor instance is saved in a database by invoking DataManager.commit(). The saved instance returned by this method can be set to an attribute of an entity related to this file. Here, FileDescriptor is simply stored in the database. The file will be available through the Administration > External Files screen. 7 After processing, the list of files should be cleared by calling the clearUploads() method in order to prepare for further uploads. Maximum upload size is determined by the cuba.maxUploadSizeMb application property and is 20MB by default. If a user selects a file of a larger size, a corresponding message will be displayed, and the upload will be interrupted. The accept XML attribute (and the corresponding setAccept() method) can be used to set the file type mask in the file selection dialog. Users still be able to change the mask to "All files" and upload arbitrary files. The value of the attribute should be a comma-separated list of masks. For example: *.jpg,*.png. The fileSizeLimit XML attribute (and the corresponding setFileSizeLimit() method) can be used to set maximum allowed file size in bytes. This limit defines a maximum size for each file. The permittedExtensions XML attribute (and the corresponding setPermittedExtensions() method) sets the white list of permitted file extensions. The dropZone XML attribute allows you to specify a BoxLayout to be used as a target for drag-and-dropping files from outside of the browser. If the container style is not set, the selected container is highlighted when a user drags files over the container, otherwise the dropZone is not visible. See Loading and Displaying Images for more complex example of working with uploaded files.